The beet is a nature-made, all-in-one salad: Its big, red-veined leaves provide the leafy base, the roots make for nice, solid chunks and the stems are like a thin, red celery. Once you have your beet, everything else is just decoration. We decided to return to the Friday farmer’s market in the Tel Aviv port, after our success last weekend led to a week of fun with purple vegetables. Indeed, it’s been more than a week since I declared Purple Food Week, and the vegetables aren’t gone yet. I suppose I could rename it Purple Food Fortnight. In any case, we returned to visit the guys from Moshav Geulim (in the above photos), who sold us the vibrantly colored carrots and cauliflower last week. This time we came away with a green cauliflower (for variety’s sake) and a beautiful bunch of beets. 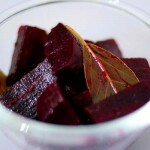 The beets themselves were small and slender, and topped by a good 30 centimeters of stems and leaves. 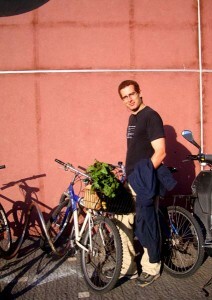 We also got some snow peas, asparagus and white savory from Carmel Yevulim (see photo). But more on that later in the week. So, back to the beets. 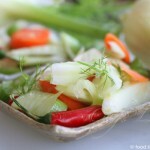 I was inspired to turn them into a colorful, wintry salad, with citrus and snow peas. The one disadvantage of using beet leaves straight off your beet is that they’re a bit tougher than the leaves you usually find in salad mixes, so you need to rip them into small pieces and remove the larger veins. The upside is that they can sit for a while (read: an hour or two, not a day) in the dressing without becoming too soggy. Here goes. This salad makes enough for two people, if you’re us and eating it as a meal, or 4-8 if it’s being eaten as an appetizer. It’s quite filling, and we had it alongside a few slices of cheese from the Noked dairy, again from the farmer’s market. These weights are what I got from two beets, the zest of one orange and a small handful of snow peas. I tossed in some carrot greens for good measure. Remove the leaves and stems from your beets (if you’re lucky enough to have entire beets), and rip the leaves into bite-sized bits, without any tough veins. Mix with the spinach and arugula, sliced in half and with tough stems removed. Remove any rough spots from the beet peel, quarter the beets, and then slice them into very thin slices — since they’re not cooked, you don’t want them to be too thick, or they’ll be hard. Halve the snow peas, and remove any hard tips. If you have beet stems, chop a handful into little bits. Mix with the leaves. 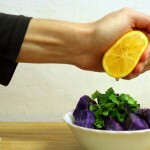 Meanwhile, prepare the dressing, by mixing the olive oil, lemon, orange zest, sugar and salt. Toss well with the salad. You can let it sit for a while to absorb the flavor, especially if the leaves aren’t that young. Add chopped chives to serve. 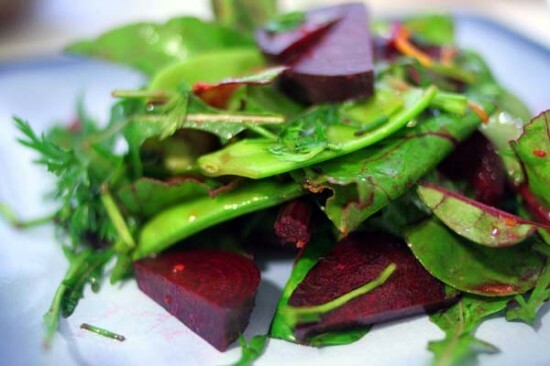 One Response to "Winter salad with beet, citrus and snow peas"